Improved heat and shock resistant case, protects vital electrical components. Low-power, low-heat, full-brightness and vivid color display. Ethernet, Serial (RS232/485), USB Host/Tool, and SD card slot options. XPANEL Designer has powerful features, including an unlimited tag database, communication drivers, more than 20,000 graphics library objects and a user-friendly interface making for easy development and integration. Data can be saved to its internal memory, SD Card, or USB Memory. Project can be transferred to other XPANEL models resized. Projects can be transferred on all XPANEL displays. The scripting functions are both easy to use and very powerful and compete with other industry-leading SCADA systems. Projects can be password protected with XPANELDesigner to deter unauthorized users from making changes or downloading the program. Reports can be saved as CSV files onto the internal memory; SD card or USB memory card and can be viewed in Microsoft Excel. Provides more than 20,000 different graphic objects to assist with rapid project development. Without a PC connection, the operation screen on XPANEL can be saved in a Bitmap file for future reference. Users can simulate projects within the interface before installation. Multiple languages can be shown on one page and are compatible with fonts supported by windows. Protects system from unauthorized access with 10 layers of security. One Ethernet port communicate with several devices at the same time. Data can be shared between CIMON-SCADA and XPANEL to configure your custom network. High performance LED with low heat and low energy consumption without sacrificing image quality. Easy to use and programmed in C language. Various functions are provided for users to implement custom functions. Supports different varieties of barcode readers and RFID readers to process logistics management effectively. 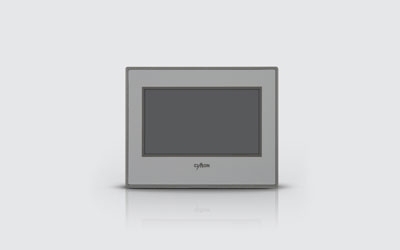 XPANELs connected via Ethernet can be controlled using a PC or smartphone. Users can create reports in Microsoft Excel based on hourly, daily, monthly, or yearly metrics. XPANEL memory values can be saved by presetting custom functions. A maximum of 10 groups and unlimited alarm notifications can be registered. Alarm history is saved to CSV file which then can be accessed in Excel. Pre-register necessary settings for production and manufacturing process in XPANEL to save production time. 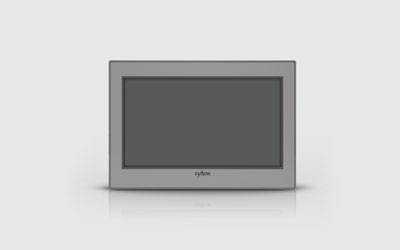 The most advanced micro PLC integrates seamlessly with HMI featuring vivid and sharp display– 100X100mm standard VESA Wall Mount Hole is equipped on the back for easy attachment to a VESA mounting arm. 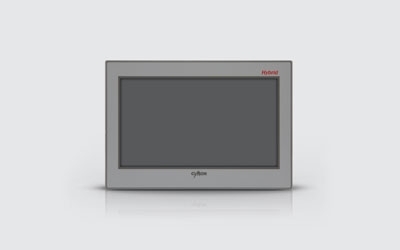 Expandable with PLC-S Modules– Existing PLC-S expansion modules work with XPANEL Hybrid. (Maximum 2 PLC-S expansion modules) Genuine PLC Integrate..